Product information "HAIX Black Eagle Safety 55 Mid Side Zip"
At HAIX®, with any boot you choose, you know you are getting the best and with the Black Eagle® Safety 55 Mid Side Zip that is no different. As the newest entrant to our EMS station boot line, The Black Eagle® 55 Mid side zip safety boot takes comfort and safety protection to a whole new level. Constructed with a softer tumbled European leather, you are going to feel the difference right out of the box. Extremely lightweight, the cushioned comfort of the foot bed will ensure you sail through the daily grind of the EMS First Responder. These handy side zip safety boots can be put on or off in a matter of seconds. Lace these waterproof work boots at the front once for a custom fit, then forget it. Even though these EMS station boots are lightweight and comfortable, they also offer some of the best protection around. The Black Eagle® 55 Mid side zip safety boot is metal free, and offers ASTM certified toe and puncture protection. The roomy carbon fiber toe cap features flexible transition edging to take the pressure off the toes when bending and stooping. The puncture resistant midsole is flexible, extremely lightweight, and completely metal free. And with the metal free features built in, these EMS station boots are certified electrical hazard boots too. When you are dealing with an emergency, and are needing to move a patient quickly, slipping is just not an option. Smooth floors, wet weather, or even spilled biohazards can be an invitation for slips and falls. HAIX® soles offer superior grip capabilities in any situation. The lightweight and athletic sole construction offers improved heel to toe control in all weather conditions and is especially abrasion resistant. The non-marking rubber outsole is also resistant to heat, oil, and gasoline. To further enhance your wearing comfort, Black Eagle® Safety 55 Mid Side Zip safety boots have a built-in Climate System. The climate system works in conjunction with the HAIX® breathable leather and CROSSTECH® inner liner to keep feet from getting too wet, hot or cold. Your feet stay dry and at a comfortable temperature no matter how much stress your feet are under. The CROSSTECH® inner liner is not only waterproof but chemical and bloodborne pathogen resistant too. So your feet stay protected no matter what an emergency can throw at you. As with all HAIX® boots, these side zip work boots are German Engineered and European manufactured to give you the highest quality EMS boots on the market. Related links to "HAIX Black Eagle Safety 55 Mid Side Zip"
Customer reviews for "HAIX Black Eagle Safety 55 Mid Side Zip"
Bought these to replace my worn out GSG-9 HAIXboots, got them, and, ended up wearing them 4 days in a row, 12 hours per day!!!!! No, problems, great fit, comfortable right out of the box!!!! Will buy more.......and recommend them highly to my friends and co-workers!!!!!!!!! These boots are by the best that I have owned. They took about a week to break in and they feel amazing and I can wear them all day! I will definitely be doing future business with Haix! No break-in period needed. Impressive details. I bought these as my first pair of Haix last week. I hesitated to order boots online without trying them on, but recommendations from friends got me over it. It turns out the sizing instructions were spot-on. I wore the boots 10 hours a day for four days straight, in the office and in the field with no discomfort. I put them on, adjusted them, then forgot about them. Until a fire extinguisher dropped on my toes and I felt nothing. :) They can be adjusted perfectly, and the zipper is extremely convenient. Consider me a satisfied customer. Thank you for your positive feedback on the Black Eagle Safety 55 Mid Side Zip. We are pleased that these boots have been comfortable on the job with minimal break in time. We hope you will continue to be a loyal HAIX customer in the future. I really like Haix boots for station wear. As a primary purchaser for my department, I am always looking for something new and better that I can provide for my firefighters. I have been waiting for a side zip boot option from Haix to fit those people who can't seem to get the front zip boots tight enough. As for the boots themselves, I have purchased and worn them every day for about a week. The first thing that comes to mind when trying to describe these boots is the constant squeaking. Every time you walk, the leather on the front where the laces are rubs and squeaks annoyingly. Outside, probably not a big deal but I have been wearing them in an office and it has become a running joke for people to mention my squeak when I am walking around. Otherwise, the boot is comfortable, considerably lighter than the other front zip models and it has nice clean look to it. If I were to give recommendations for improvement, it would be to solve the squeak and provide just a bit more room to occasionally fan out my toes. We appreciate your review of the Black Eagle Safety 55 Side Zip. We are glad that the boots are comfortable and lightweight and that you like the look and feel of them. We apologize about the squeaking issue with the boots, but I have passed along your concerns to the sales manager in your area and he should be following up with you about a possible warranty claim. We hope this will not deter you from considering HAIX again in the future. At first I was unsure about these boots. I had to order the extra wide boot because the cut around my big toe was tight and even with the extra wide it's still extremely close and after owning them for about six months the laces are starting to fray. The break in time wasn't long and there are times that I may wear these boots up to 16 hours a day. Now here is what impressed me. We spent three days executing a structural collapse exercise and these boots were put through everything. After three days plus the weeks prior associated with prep time the boots looks rough. I rinsed off the dust and dirt then added a coat of wax. There was no damage to the boots. The toe guard did its job where those who had other boots the toe of the boot had deep cuts. If they would widen out the toe area and have some better laces I would give them a 10. Thank you for sharing your experience with the Black Eagle Safety 55 Mid Side Zip. We are glad that you decided to give HAIX a try and that there was minimal break-in time on the boots. We are also happy to hear that these boots served you so well during your training exercise and they didn't suffer any damage. We apologize that the laces have frayed after only 6 months, but I am certain that we came to a reasonable solution. I will also pass your concerns about the width of the toe box to upper management for consideration. We hope this won't deter you from purchasing HAIX products again in the future. Stay safe out there! Love these boots, well worth the price! Have had my boots for several months they are comfortable and durable! Ive read where people have issues with the zipper, the zipper works just fine. I uave a bad ankle and these boots make my feet hurt less. after a 24 hour shift i dont limp around as bad with boots as I have with others! If and when these wear out I will be purchasing another pair!! Thank you for taking the time to review the Black Eagle Safety 55 Mid Size Zip. We are happy that these boots are comfortable and durable out on the job. We are also glad that your feet hurt less in these boots even after a long shift. We appreciate you giving HAIX a try and hope these boots serve you well in the future. We hope you will remain a loyal HAIX customer in the future. Very disappointed with my purchase the boots are OK but when I find out that I had to be for delivery on the $400 pair of boots I was a bit upset when you consider these these most companies ship for free over $25 purchase plus they tend to run bigger than the size, The right Toe cap seem a bit misplaced and it took long time for delivery from ups (the worst) so next time i will pass on haix! Thank you for your review of the Black Eagle Safety 55 Mid Side Zip. We are sorry that you were disappointed with your purchase. Many of our boots do run about a half size larger than a normal shoe. If you ever have any questions about sizing, please feel free to reach out to our Customer Service Dept. or via the Live Chat feature in our webshop and they would be happy to help. Unfortunately, we don't offer free shipping to Canada because of the high price of duties. Orders shipped to Canada can require additional delivery time because of increased security measures at the border. 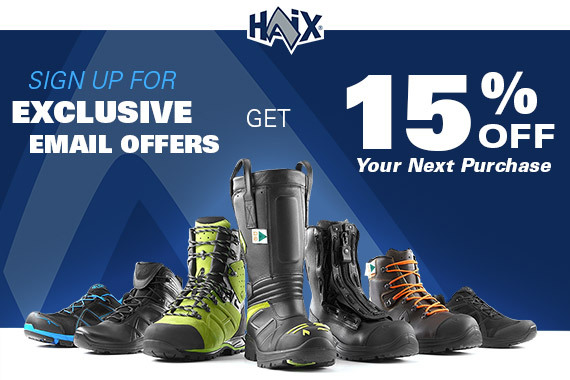 If you decide to give HAIX another try (which we certainly hope you will) you can always have your boots shipped to a friend in the U.S. so you can get free or discounted shipping when it is being offered. Again, I apologize for the inconvenience and hope you will consider HAIX again in the future. Bought these about 6 weeks ago. I like how light and flexible they are. I also love the side zip and toe cap. Unfortunately I had to spend even more money to go back to the R8 because the way they are designed it is bruising my left heel badly. We appreciate you taking the time to share your experience with the Black Eagle Safety 55 Mid Side Zip boot. We are happy to hear that you like how lightweight and flexible the boot is, along with the side zip and toe cap features. We apologize that this boot bruised your left heel. Maybe the boot is too small? I am not sure but we definitely didn't want it to be uncomfortable for you. If you have any questions or further concerns, please contact our Customer Service Dept. at 866-344-4249. Thank you for your business and your service.